Mother Box gives Superman new gear to help stop Doomsday and takes him and Waverider to Calaton. (What they don’t know is that Doomsday still has The Cyborg’s intelligence, which he hopes to turn into a weapon under his control in the future.) As expected Doomsday has evolved past the new Radiant’s ability to defeat him. Waverider uses his powers to link with Doomsday and learns that Doomsday is targeting Superman because his creators were Kryptonian. Superman also learns Doomsday remembers him from Metropolis and that he can talks…sort of. However, even Mother Box isn’t able to help him stop Doomsday and even Waverider is powerless before him. Superman takes the dispersed Waverider’s time device and uses Mother Box to find a place that Doomsday can be beaten, which turns out to be the end of time. Waverider pulls himself together in time to bring Superman back home, and the Mother Box uses the last of her power to heal Superman and repair his clothes. What they got right: Having Superman recalling his childhood fear of the basement showcased his fear of facing Doomsday again and it works in the payoff this issue as a bookend to issue #1. The fight is good and I don’t think we need to ever see Doomsday again after this story. What they got wrong: Except he will keep popping up again in one form or another even after the New 52 reboot. This should have been the last Doomsday story but it isn’t. I also wonder how Superman jumped to the (admittedly correct) conclusion that Doomsday was created by a Kryptonian so easily, or why Bertron looked so alien? He doesn’t look like a Kryptonian, which may be to hide the reveal but it’s not explained. I can believe his assistants came from Krypton but if Doomsday’s hatred is for Bertron specifically that shouldn’t matter. 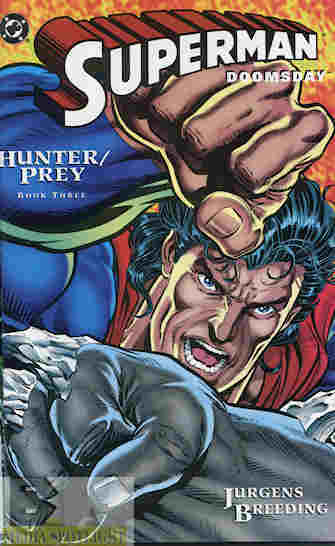 Recommendation: Overall Superman/Doomsday: Hunter/Prey is a good story and should have been the last Doomsday story. It’s a good origin as well. Worth picking up. As for the trade I’ll be reviewing that Sunday over at The Clutter Reports. Posted by ShadowWing Tronix on February 12, 2018 in DC Spotlight, Yesterday's Comics and tagged Doomsday, Superman, Waverider, Waverider (comics).